Owen Farrell impressed in front of the watching Eddie Jones as Saracens booked a home quarter-final thanks to a 33-17 win over Ulster. Farrell was uncharacteristically poor from the kicking tee, completing just five of his nine shots at goal, but he conjured the critical try for Duncan Taylor that swept the English champions out of sight. With England head coach Jones watching from the stands, man of the match Farrell showed his vision by gliding through the Ulster midfield before feeding Taylor a pinpoint pass in the standout moment of afternoon. The 24-year-old is expected to start the RBS 6 Nations opener against Scotland at inside centre and his performance will have reassured Jones ahead of the Murrayfield showdown on February 6. 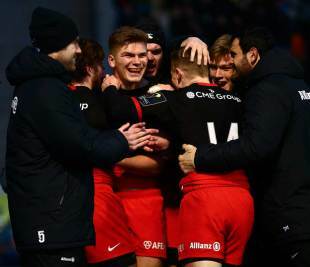 Saracens bounced back from their first defeat of the season against Harlequins last weekend with a bonus-point demolition of their closest rivals in Pool One to underline their status as Europe's top performers. Billy Vunipola, Taylor, Maro Itoje and Schalk Brits helped themselves to tries to place Mark McCall's men 11 points clear at the summit of their group with one game to play, in Toulouse on Saturday. It was a typically powerful performance from the home pack who ground Ulster into the Allianz Park turf in the second half. 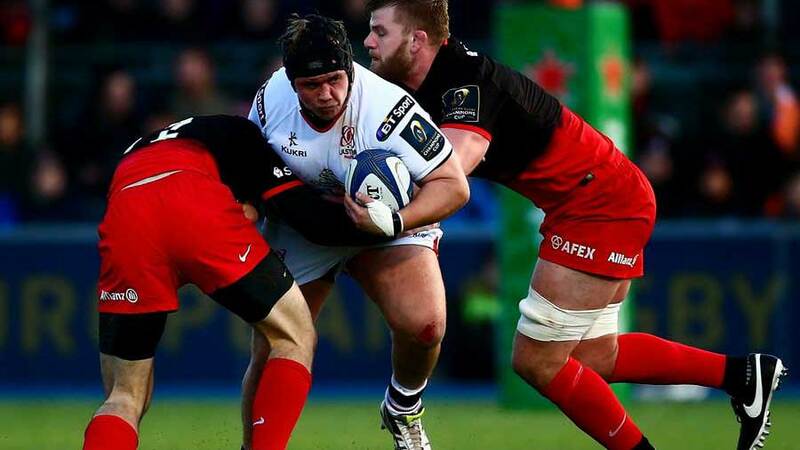 Defensive lynchpin Brad Barritt was ruled out by a groin injury shortly before kick-off and Saracens felt his absence as Ulster crossed with just four minutes on the clock. Stuart McCloskey exploited a large gap with a muscular run to begin the move and several phases later another void opened up, but this time the English champions were camped on their line. Ulster had several options and full-back Jared Payne chose to grubber ahead and the weight of the kick gave Luke Marshall the time to gather and touch down. Chris Ashton was penalised for a neck roll on Marshall, offering Ulster temporary respite from an otherwise ongoing assault from Saracens who were dominating territory and possession. With Farrell landing only two of four penalties, however, their ascendency was not being reflected on the scoreboard and they were forced into a defence of their whitewash after conceding ground because of their errors. Once they had regrouped, they secured a short-range line-out and the driving maul proved impossible to stop as backs joined the surge that resulted in a try for Vunipola. Full-back Ben Ransom athletically plucked a kick by Paddy Jackson from the air, but Saracens had been penalised and the Ireland fly-half landed the three points. Saracens led just 13-10 until Farrell took centre stage in the third quarter to establish daylight between the rivals. A penalty was followed by a superb show and go that swept him through a disjointed Ulster midfield and Taylor was on hand to complete a score created by Farrell's vision. Saracens turned to their all-conquering set piece for their third and fourth tries with the line-out providing the platform for Maro Itoje to drive over and Schalk Brits burst clear and touch down. Humphreys picked off a loose pass by Neil de Kock to claim a late consolation try, but the result had been sealed long ago.